I think that the way it should work is that we spend our time among teachers who give us tools for thinking on our own. I fear that the way it does work -- too often if not always -- is that we spend our time among talkers, from whom we select a few whose words we'll take as gospel truth. In this case we are not students, but lemmings with large vocabularies. Amy the Flight Attendant: OK, boys and girls. There are 26 of you and 130 seats on the plane. Do the math. Spread yourselves out. Lie down and take a nap for me. I need one. The Captain: Greetings from the folks in the front row. Thank you for flying with us today. If you come again, please bring some friends. Amy again: If you're seated in an exit row, you must be at least 15 years old and physically capable of operating the doors in case of an emergency. If you do not meet these conditions or if you do not wish to fill this role, please let us know and we will find you another seat. Oh boy. Those people in the exit row are not even looking at me. They have no idea. I'm getting seriously scared. [upon reaching the RDU gate], Amy again: OK, get out. I'm glad that Southwest encourages humor, because punchy-tired-Amy would have done badly if she had to play it straight. I suspect that many Southwest staff see their FAA-mandated communications as an opportunity to see how well they can amuse themselves, their colleagues, and frequent fliers while staying within the rules. It's their airborne version of The Aristocrats. Room with a view, but not much of a floor. Click here and here for more context. As a first-generation Asian food eater, I'm in that awkward class of people who (a) grew up eating Asian foods but (b) without being fully steeped in the Asian food marketplace. Which is to say: I have lots of appetite for good Asian food, but I don't havee the trained-from-childhood intuition for how to find what I want "in the wild." Immigrant Asians have ingredient hunting and gathering programmed into their DNA. When they move to a new country, they find out where all the food sources are because they have to. If they don't get their regular supply of whatever-it-is-dish-or-ingredient-they-need, they'll die. So they make the effort to find out where to get what they need. By contrast, first-generation folks commonly fall into an equilibrium defined by (a) catch-as-catch-can of what we love combined with (b) constant frustration that we don't get enough. Maybe this is why I get more excited than most people whenever I get to know a new Asian restaurant or food store in the Triangle. 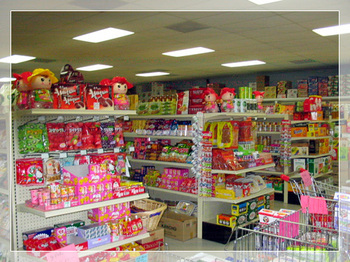 Around here, the Grand Asia Market in Cary is hands down the biggest and best. I love to cook what they sell me. But of course, Grand Asia Market isn't the most convenient for folks in Durham and Orange Counties. Last week in Durham, I was happy to run into Shilla Oriental Food & Gifts near the southeast corner of Highways 55 and 54. Shilla has been in business for just over a year and I sure hope they'll stick around. Korean items are at the core of their offerings, but they have plenty of goods from Japan, China, and elsewhere. The store is small and crowded (count on backtracking at least once or twice when you find yourself sharing an aisle with another customer), but you may be surprised at just how comprehensive their selection is: with everything from cookbooks, to a half-dozen fish sauces (including my favorite: Rufina from the Philippines), to a five-pound container of chili paste. Their are eight or ten doors worth of frozen goods with some items I haven't seen elsewhere and look forward to trying. Unfortunately, their selection of fresh vegetables and other produce is very small, but hey -- you can't have everything. The staff are friendly and English-friendly. If you have questions, I suspect you'll get the advice you need. From the corner of 55 and 54 (aka "Indigestion Intersection") heading south, Allendown Dr. is the first road to your left. photo from the Shilla website. "I remembered now--I failed to make the connection earlier--that Mickel and Beitel's book, the fern bible, was dedicated to Boone, for it was Boone who originally suggested to John that he catalog the ferns of Oaxaca. Oaxaca, he said, was probably richer in ferns than any other state in Mexico, and also among the least studied. Incited by Boone's suggestion, John had made a series of trips during the sixties and seventies, collecting nearly five thousand specimens from all over the state. Boone himself contributed another five hundred in the early seventies, many of them rarities. By 1988, when the Flora was published, John and his colleagues had discovered no fewer than sixty-five new species of fern, and a grand total of 690 species, in Oaxaca alone. 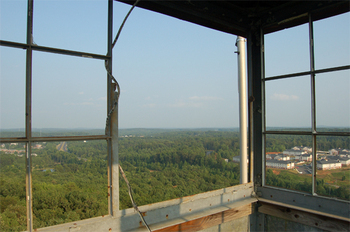 Boone had been behind all this, providing room and board, guide service, logistical support and transportation. Here in Mexico, Boone is saying, you have to use your brains to know what's going on. In the States everything is published, organized, known. Here it is under the surface, the mind is challenged all the while." -- Oliver Sacks in Oaxaca Journal. Of the above quote, the important part is the second paragraph. Unfortunately, I couldn't really share the second paragraph without also asking you read the first. I like Oaxaca Journal for its glimpse into the world of very smart people, some who are at the creating edge of science, together in place where they simultaneously live in the airy space of thought and the earthy space of "I ate too much for lunch and now I'm feeling sick and have to sit down." Richard Feynman had potential for some of the same in Surely You're Joking, Mr. Feynman but he didn't choose to take the same route. For more insights into the reflective parts of Feynman's world, you'll have to read Genius, James Gleck's Feynman biography. Taking cues from Kevin and Toastie, I trotted over to Durham's Blu Seafood and Bar for dinner with a friend. I'll write about the food in a moment, but I want to start with the service. What I liked best about Blu is not that their service is particularly smooth or competent (sometimes it was neither) but rather that the staff treat their customers as people. All night, I felt more like a dinner guest than one of many customers in a restaurant that needed to keep things moving. From the bartender who interrupted his appetizer prep to get me a Diet Coke, to the numerous staff who struggled to hold the patio-door open every time I walked through (hint: you really can't do a smooth job holding a door when you're standing on the side near the hinge. You need to be by the door handle, or else you're going to be in the way -- it's a fact of life) to the server who mispronounced two of the seafood items, to the manager who took care of our problem dish -- every person looked me in the eye, listened, and made me feel like they really wanted to make sure I had what I needed -- no matter how much time or trouble it would take. That's a nice way for a restaurant to be. I hope they stick with it, and I hope it helps turn Blu into a successful business. My brief take on the food? Pretty good. Some items great. Some not. A decent price-to-value ratio. And I suspect that they'll continue improving as they find their groove. I particularly look forward to returning for dessert -- they have a fun sweets menu that looks like an excellent end-of-evening activity. Dark chocolate fondue for two, anyone? Anyone? Call me. We're there. 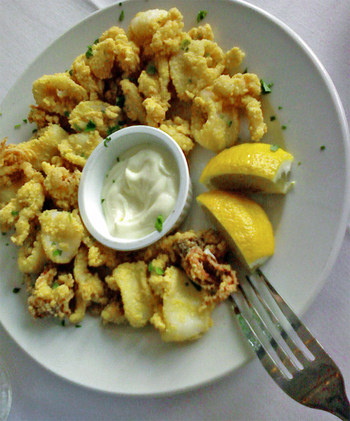 The calamari deserves praise for two things: (a) a very tender texture* (the most tender I've had in decades of calamari eating) and (b) an appealing and atypical cornmeal breading. Like Kelly at the Durham Foodie, I would have enjoyed a more interesting lemon mayonnaise; but on the other hand, a less interesting sauce lets me pay more attention to the calamari. This is not a bad tradeoff when the calamari is good. The mutton snapper came with an excellent mix of vegetables. Unfortunately, it also came way overcooked so we sent it back. Instead of asking for a re-do, we changed our request to the pan-roasted trout. That was a great idea. The trout was pan-roasted to a very nice crisp and was combined with a little bit of vegetables in vinaigrette, plus a line of very tasty, tube-squeezed mashed potatoes. The two-fillet serving was generous but the whole dish wasn't "too much" because they kept the vegetables and potatoes in rightly small portions. For dessert we were treated to a "Blu Berry" cobbler -- sent over, I presume (they didn't make a fuss), because of the little mishap with the mutton snapper. It was a nice little cobbler, easy on the sugar, which always makes me happy. A nice visit -- I'll be back. *no easy trick, as noted by Kelly at Durham Foodie. Also: for those who are wondering about decor/construction. Blu has enclosed some of the former Grasshopper patio, but there is still some open-air seating. My journey into hospitality began twenty years ago as I worked with refugees and poor people in my local church. Even before then, however I had felt specially drawn to people with disabilities and to those troubled folks who simply needed a friend. I noticed how they were frequently overlooked in the busyness of everyday life and sensed that their invisibility was a loss to everyone. Often, as my life intertwined with theirs, I found myself enriched and changed. During those years I did not have access to the vocabulary of hospitality, but I knew intuitively that I had touched on something very important. ...A mystery of hospitality is how often one senses God's presence in the midst of very ordinary activities. Even in writing on the topic, I frequently found myself walking on holy ground. Over and over again, I've come to see that in God's remarkable economy, as we make room for hospitality, more room becomes available to us for life, hope, and grace. "Don't make this a habit, young man. You know this family isn't made of money. How you're first couple of weeks in college going? You having a ball?" I began weeping and couldn't stop. I'd suffered a mild breakdown of spirit and character as I lost grip on all the words I'd planned to say to my mother. For thirty seconds I sobbed until I could gain control. "Mom, you sent me to a torture chamber," I gasped out finally. "Well, it'll be good for you. It'll make a man out of you." "It'll make a man like Dad out of me," I snapped back. "Just how bad is it?" Mom asked. "Give me an example." "It's worse than Dad--that's how bad it is. I'd much rather be living with Dad than going to this school." After a long pause, my mother said, "Oh, my God." Then my father took the phone, and I heard his despised, mocking voice. "It sounds like my little baby boy's having some boo-hoo time with Mommy. If baby boy wants to do some whining he can talk to Daddy-poo." "I don't like the Citadel, Dad," I said, controlling the quaver in my voice. "I'm thinking about coming home." I heard my father's laughter, then the hardening of his voice as he asked, "Where's home, son? You no longer have a home." He hung up before I could talk to my brothers or sisters. I read this and hate to remember that My Losing Season is not a work of fiction. And yet, Conroy lives grateful. Listen to Terry Gross's 2003 interview with Pat Conroy, here at Fresh Air. 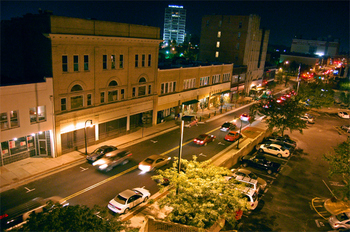 Main St. Durham (looking west) from the roof at Ringside. This pic taken on July 4, 2007, ~11 p.m, shortly after the fireworks display at the Durham Bulls Athletic Park. First, there's actually traffic downtown at night. Second, the westbound cars can keep on driving all the way to Brightleaf Square and beyond. Until a few days earlier, they would have had to turn right on Morris St. because of the screwy block of one-wayness between Morris St. and Great Jones St. (in front of the departed Joe & Jo's). Things are better now. Except for getting used to that wacky huge "X" of an intersection. 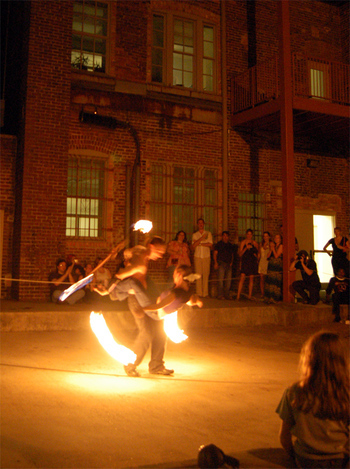 Cory and Tania, fire dancing at Ringside, downtown Durham. Click to turn up the heat. This is what I think I'm learning: my life will be much richer when I learn to expect less of my friends, and to ask more of our friendships. I suspect that I've often thought or unconsciously hoped that my friendships would be good all the time simply because I picked great (and greatly suited for me) people to be friends with. The thing is, of course, that even the great and greatly suited people will not always be what I want them to be: they will not be mind readers who know what I want, they will not always be in an appealing mood, they will not always be healthy, they will not always be fair, they will not always be heroic, they will not always be without an unreasonable need, they will not always be perfectly patient with me, and they will not always be the person I was attracted to and thought I knew when we first met. They will not always be what I want them to be, where I want them to be, when I want them to be. It is a gift to grant myself this disillusionment. And the next gift will be to live with the faith and understanding that friendship is not only built from acts of asking, giving, taking, and erring; but that it also grows stronger from the mix of things that result: receiving, pleasing, surprising, forgiving, correcting, and understanding. And maybe even at the end, accepting and appreciating. It's not that I don't do some of these things now. But I think I'm ready to peel another layer of the onion -- which comes, like all good onions, with sweetness and tears. *which read, "my life will be much richer when I start having lower expectations of my friends, and higher expectations of our friendships."